Saddle sores are inevitable and one of the most common issues faced by cyclists. Be it a newbie, recreational cyclist or long hours training, saddle sores have the ability to take the joy out of your ride. Spending long hours on the saddle can help your muscles to get adapted overtime. Saddle sores don’t have a complete cure, but by taking the right steps they can be reduced drastically and the fun can be enjoyed between your legs. Bacteria, sweating, hot weather are inevitable factors which will give rise to sores on long distance rides. Whereas on the other hand many are prone on getting them in spite of doing everything right. The key factor is to give them the required attention and deal with them patiently when you get them. How to avoid and treat saddle sores? 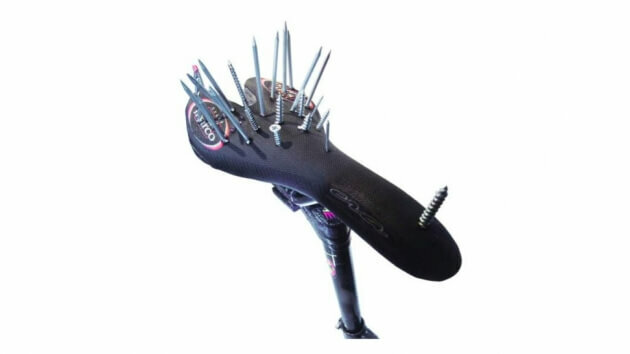 One of the keys to avoid and treat saddle sore is to get the right bicycle seat. A wider seat will cause sores while a narrow seat won’t provide enough room to support your rear. Choosing the right seat is a process of trial and error. So keep calm and choose the right one. The best shorts to wear to avoid abrasions are the bib shorts. These bib shorts unlike normal cycling shorts keep the chamois in place and help avoid saddle sores. The movement of chamois can make you feel uncomfortable which then causes friction leading to chaffing and eventually sores. Also, look for shorts with a one-piece liner or one that’s sewn with flat seams. The wrong bike fit is the biggest mistake any cyclist can get himself in. It won’t only affect your riding but also lead to backache, etc. If your seat is placed high or your hips rock on each pedal, it could lead to skin irritation and increase the chances of infection. So, it’s better to get your position checked by an expert or a bike shop. Doing so will help you avoid and treat saddle sores to a large extent. You might start off your ride by wearing a clean pair of shorts, however, at the end, they will be sweaty with colonizing microorganism and bacteria built up. The best way to get rid of this issue is by quickly changing and taking a clean shower. Moving on the saddle and standing up frequently will help you reduce pressure off your bones. Standing frequently will help you not only help better blood circulation, but also take pressure off your crotch. A few stretches while riding can also be helpful. To move on the saddle or while standing take advantage of climbs, rough patches of roads. Sitting on your saddle reduces the flow of blood and oxygen to your muscles. If you’re resuming cycling after a long time, it’s definitely not a good idea to start out strong which you are not. Your muscles which include your hamstring and your buttocks have been out of training and need to adapt and get stronger slowly and steadily overtime. Hence, starting off with longer distance will not be of any help. This will lead you to saddle sores forcing you to abandon cycling for a while and in some cases demotivate you. Not many make use of chamois cream in India. If you are planning on riding longer distances, using chamois cream can be a good idea. This will help you avoid and treat saddle sores largely. There are several home remedies that are effective and come in handy to avoid and treat saddle sores. These remedies include the use of oils, glycerin, baby powder and talcum powder which are proven effective.